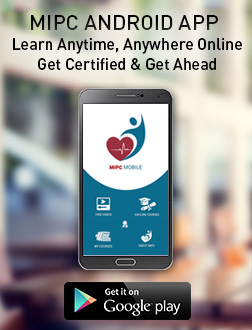 MIPC stands for Madhavbaug Institute of Preventive Cardiology. MIPC is the very first Interpathy chair of Preventive Cardiology established in Maharashtra University of Health Sciences (MUHS) , Nashik. It is an Academic Unit of MUHS, Nashik. What is meant by a chair? Chair is an academic unit of MUHS Nashik established with the purpose of curbing the growing epidemic of heart disease so as to reduce untimely and unfortunate deaths in our society with the help of ‘EDUCATION, RESEARCH & AWARENESS’ about ‘PREVENTIVE CARDIOLOGY’. Tell me about your Fellowship in Preventive Cardiology course? 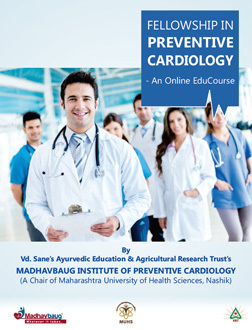 Fellowship in Preventive Cardiology is 1 year course affiliated to Maharashtra University of Health Sciences, Nashik. It’s an E learning course followed by observership program. What will be taught in thE learning course? Tell me about the syllabus. This course covers Preventive as well as Curative approach in Cardiology as per the modern science, Ayurved as well as Homoeopathy. It includes Basic Principles of Ayurved and Homoeopathy, cardiac anatomy/physiology, various cardiac investigations, Pharmacology, Procedures like Bypass Surgery, Angioplasty etc., Treatment modalities and Dravyaguna as per Ayurved, Homoeopathic drugs in Cardiology along with Cardiac Rehabilitation which includes Yoga, Meditation, diet management, Exercise Therapy. I am a practitioner since last 10/15 years and have no touch with theory. Shall I be able to do it? Will you be teaching us basics too? Yes, we will be covering it. We have designed the curriculum in such a way that you will be able to take it up easily. Will there be any lectures conducted to cover this syllabus? It’s an E learning course, so the entire syllabus will be covered through E learning module which will be delivered in an App known as ‘MIPConline’. The lectures of renowned faculties recorded in Audio Video format will be delivered through this App along with intermittent exams. There will 6 to 8 days of Contact Program throughout the year which is a platform to resolve your queries as well as interact with faculties. What do I do in case I have any query related to A/V content while E learning? There is a provision to ask your questions related to A/V content which will be directed to faculties and they will get back to you with answers. What all are eligible for this course? BAMS/MBBS/BHMS doctors are eligible for this course. DHMS doctors with 10 years of clinical experience are also eligible. I have completed my 3rd year of BAMS and internship is currently going on. Can I enroll myself right now? You need to complete your internship which makes you eligible for this course. What are the minimum requirements of PC/Laptop if I do not want to view my online sessions on mobile or through App? 1024x768 resolution, SVGA and above graphics. Google Chrome / Fire fox browser. Please tell me the minimum configuration of mobile required for running this app and seeing the sessions online? For Mobile, Android version must be 4.4.2 and above. The App is also available on Apple IOS / mobile Windows Operating system. Minimum requirement of internet is 2G but for better experience 3G is recommended. Observership Program of 15 to 30 days will be offered at hospitals in Mumbai/Pune. We are currently talking to a few of the renowned hospitals in Mumbai and Pune for Observership Programs. But I am a practitioner; I will not be able to spend 15/20 days or 30 days for this observership Program? Do not worry, we are trying to make these programs flexible for working doctors as well as practitioners. It is not necessary to give 15 to 20 days at a stretch. It can be divided in 2 or 3 Parts and completed as per your convenience. What are we going to see in our Observership Program? You are going to be as an observer in a Hospital where you will be placed in an Investigation dept where major cardiac investigations are performed along with Coronary Angiography in the cath lab. Likewise you will be attending the Cardiac OPDs as an observer, taking rounds as an observer in Cardiac ICU etc. There would be a visit to Madhavbaug Hopsital Khopoli to observe Ayurvedic Treatment modalities for Cardiac ailment along with cardiac rehab. Are there any contact programs in this course? Where are you going to conduct these programs? Yes, there would be contact Programs after every 3 months for 2 days which give you an opportunity to interact with the faculties and clear your doubts. These programs will be conducted in Thane/Mumbai and a tentative schedule for the same will be shared with you once thE learning course starts. Would the faculties be the same as we see them in A/V Content? Not necessarily. They could be different but surely be experts in their field. Is it necessary to attend these Contact Programs? These sessions are planned for our students, for their orientation and better understanding of the subject and serve as a platform to learn and clear doubts. So it is indeed necessary to attend them. What if I could not attend? Please contact us for the same to understand further arrangements for the same. What is the evaluation scheme? Yes, there would be many intermediate exams conducted before the final one. Short quizzes will be conducted online in MCQs i.e. Multiple Choice Questions and you need to clear it with minimum passing marks. Likewise quizzes are planned based on group of lessons and every module which you need to clear with minimum passing mark to unlock further lessons and modules . What about the final exam? How will it be conducted? Final exam will be conducted in 3 stages i.e. written, practical and viva. Written exam will be conducted online in MCQs form. It would have 60 questions, each question will carry 2.5 marks and will be given 2 minutes to solve. So total 2 hours. Practical and viva will also be conducted. The Examination scheme is mentioned on our website in detail. You can please refer. But still tell me the nature of Practical and viva? ok. Practical will carry 200 marks. It will consist of short and long case taking along with Journal of minimum 50 cases (30 long + 20 short cases) along with viva. A joint certification of Maharashtra University of Health Sciences and Madhavbaug Institute of Preventive Cardiology. Can I add it as my additional Qualification? You can certainly display it along with your Qualification. Is this course recognized by any council? This course is recognized by Maharashtra University of Health Sciences Nashik. It comes under the Academic Unit of MUHS and MIPC is the interpathy chair i.e. it includes all the pathies whose doctors are eligible for this course. Every pathy has its own council but since our course is recognized by MUHS itself and being an interpathy chair, there is no need of any council affiliation. But can I go to my respective council and get it registered? Council only registers degree or Diploma courses approved by them. No Fellowships are registered by Council. You can further inquire with your council for more information. What is the scope of this course I mean what are the opportunities after this course? This course speaks about Preventive as well as curative approach in Cardiology. It imparts knowledge of Cardiac Investigations, emergencies, various treatment modalities in Allopathy and Ayurved, Pharmacology, Cardiac Rehab as well as knowledge of Cardio Pulmonary Resuscitation, Basic Life Support, Advance life support etc. This makes you eligible to work in Cardiac Hospitals, ICUs, Cardiac Rehab centres. Moreover, this knowledge strengthens your eligibly to work as an assistant to a Cardiologist which is the utmost need of all leading cardiologists now a days. You can enhance your practice by practicing on the principles of Preventive Cardiology which is Need of the Hour. Being a family physician of many families, you definitely have effective tools in your hands to help your patients to save their Hearts with Primary Prevention as well as reduce the chances or severity of future incidences by secondary prevention. Implementation of Yoga, diet management, Exercise, Stress Management, Meditation will surely raise the OPD footfall. Moreover, as a Preventive Cardiologist, you are helping the Nation to curb the growing epidemic of Heart Disease and reduce untimely and unfortunate deaths. In the scenario where Department of Aayush will have Wellness Clinics in 14 districts of the states whereas in other districts Ayurved and Homoepathy clinics will be chosen as the Wellness clinics which will function on the principle of Lifestyle modifications, there are multiple opportunities to practice and earn. In short, this course helps you to practice Preventive Cardiology, learn the integrated approach of Modern Medicines, Ayurved and Homoeopathy as well as start your career as a Health Coach / Wellness Coach. Is this course/certification valid in foreign countries? You need to further inquire with the Country you are applying to. Do you mean that I can do 2 D Echo, Angiographies after the course? We are making you equipped with these skillsets to interpret the investigations and assist the procedure. At the same time, you will be learning these skills from leading cardiologists and physicians. How does this course help me as a B.A.M.S.? As an Ayurvedic Physician, you can treat your patients for cardiac ailments and associated risk factors with the help of Ayurvedic dravyas and therapies. The knowledge of modern science upgrades you as a treating physician. It helps you to understand the disease, its complexity, interpretation of medical reports as well as their prescription of modern medicines. This course also helps you to practice Preventive Cardiology, learn the integrated approach of Modern Medicines, Ayurved and Homoeopathy as well as start your career as a Health Coach / Wellness Coach. How does this course help me as a B.H.M.S.? This course does cover Homoeopathic medicines used in cardiovascular disorders along with their properties, indication, effects, dosages etc which will certainly help you to serve patients with cardiac ailment. Also as a family physician to many families, you can guide and counsel your patients effectively for lifestyle changes for future prevention. By understanding the integrated approach, you can direct your patients properly. Is it the total fees or any additional fees are going to be there? Exam fees is additional as per MUHS norms but if enroll before May15th 2016, no exam fees will be charged for you. Do I have to pay the full fees together or I can pay in parts? Fees is to be paid as per the term. You need to pay Rs. 50,000/- at the time of admission and the remaining fees to be paid by the end of the first term or beginning of the second term. Also easy EMI options are also available for credit card holders. Is there any group concession in the fees? Please contact us separately for the same. Admissions can be done online as well as offline. You can visit the institute office at Thane and pay the fees over there by a valid DD/cheque. The same can also be done through net banking. We have also developed a smarthub using which you can pay online by your credit card or debit card very safely. The link for the transaction will be sent to you via email. You can speak to our office coordinators on 9323443916 to understand the procedure of the same. Excluding the admissions done at Institute, you are requested to share your transaction details along with acknowledgement for our office records and verification. Fill it up and send it to our office address with relevant documents mentioned in the list. This completes you admission process. This process can be also done through our educational app. Hence you are requested to download it since the further learning and necessary communication from institute will be done through this App. We will keep on guiding you from time to time for the use of this app. Bank Name - HDFC BANK LTD.
Do you assure 100% placement in Madhavbaug Clinics and Hospitals after course completion? Yes, we are committed to provide 100% placement assistance in Madhavbaug as well as in other organizations and our placement partners. Shall I have to go through the rounds of exams and interviews for selection process though I have done this course with you? Yes, you need to go through the standard procedure. This will help you to understand your job requirements and whether you can fulfill them or not. After selection, shall I get posting at Madhavbaug Clinic which is near to me? Not necessarily, it depends upon where the vacancy is. Shall I get the job even if I don’t do course with you? Yes, in case suitable vacancy is there. But then you will not be hired as a ‘Preventive Cardiologist’ and entitled to get higher packages. How do I get in touch with your HR Dept?